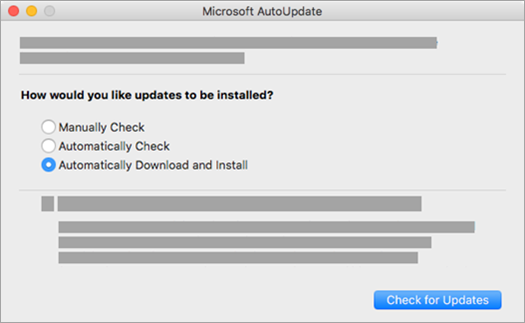 Microsoft AutoUpdate makes sure your copy of Office will always be up-to-date with the latest security fixes and improvements. If you are an Office 365 subscriber, you'll also receive the newest features and tools. Open any Office application such as Word, Excel, PowerPoint, or Outlook. On the top menu, go to Help > Check for Updates. Important: If you don't see Check for Updates on the Help menu, download the latest version of the Microsoft AutoUpdate tool. Run the tool and then start over at step 1. The Check for Updates option now appears on the Help menu. Under "How would you like updates to be installed? ", select Automatically Download and Install. If an update is available for your version of Office, you'll see a link to a website with more information about the update. Open the Mac App Store from your Dock or Finder. Click Updates on the left side menu. Click Update All, or click the Update button next to the apps that you want to update. You can join the Office Insider for Mac program to get early access to the newest Office innovations. To join, simply check the box Join the Office insider program to get early access to new releases. What is Office Insider? You can find Release notes for Office for Mac here. If you're looking for previous release downloads for Microsoft AutoUpdate, see Update history for Office for Mac. Need help with Microsoft AutoUpdate? If you're having trouble updating with Microsoft AutoUpdate, use these troubleshooting steps. Open Safari and download the latest version of Microsoft AutoUpdate. Open Finder. Press Command +Shift+h. Go to Library > PrivillegedHelperTools and make sure that com.microsoft.autoupdate.helpertool exists. Run Microsoft AutoUpdate. If the file doesn't exist, redownload Microsoft AutoUpdate using the link above. If you previously had a one-time purchase of Office on your Mac but now are an Office 365 subscriber and aren't seeing certain subscription features, your copy of Office may still be using the license of your one-time purchase and not your subscription. See How to remove Office license files for help. We are aware of an issue where older versions of Silverlight are causing Microsoft AutoUpdate to fail. See Microsoft AutoUpdate crashes with older versions of Silverlight for more information. When do I get the newest features for Office 365 ?